Reasons for concern: This is an extremely competitive plant with an extensive root system that can quickly take over large areas, outcompeting native species and reducing plant diversity and wildlife habitat. It also contains allelopathic (toxic) chemicals that suppress the growth of nearby vegetation, resulting in a monoculture. It is not commonly found in Flagstaff and northern Arizona at this time. It can cause fatal chewing disease in horses. Botanical description: Erect, branching, broadleaf herbaceous plant. Leaves: Green to light green, covered with dense gray hairs. Juvenile rosette with toothed leaves radiating out from a central point, deeply lobed, 2 to 4 inches long. Upper leaves get smaller as they go up the stem, thin and about 1 inch long. Stem(s): Erect, bushy, branching. Up to 3 feet tall. Flowers: Small, solitary, urn-shaped flower heads. Up to ½ inch across, pinkish-purple, at tips of small branches. Tips of bracts (modified leaves under the flowers) are pointed and transparent. Blooms May through September. Flower heads turn straw-colored at maturity. Seeds: Viable in soil only 2 to 3 years. Roots: Rhizomatous. Forms extensive, deep root system over time, up to more than 8 feet deep. Where it grows: Likes damp soil, full sun from 3,000 to 8,000 feet elevation. Open, recently disturbed, cultivated, and grazed sites. Orchards, pastures, roadsides, rangelands. Russian knapweed habit. Reproduction: By some seeds. Primarily by roots. 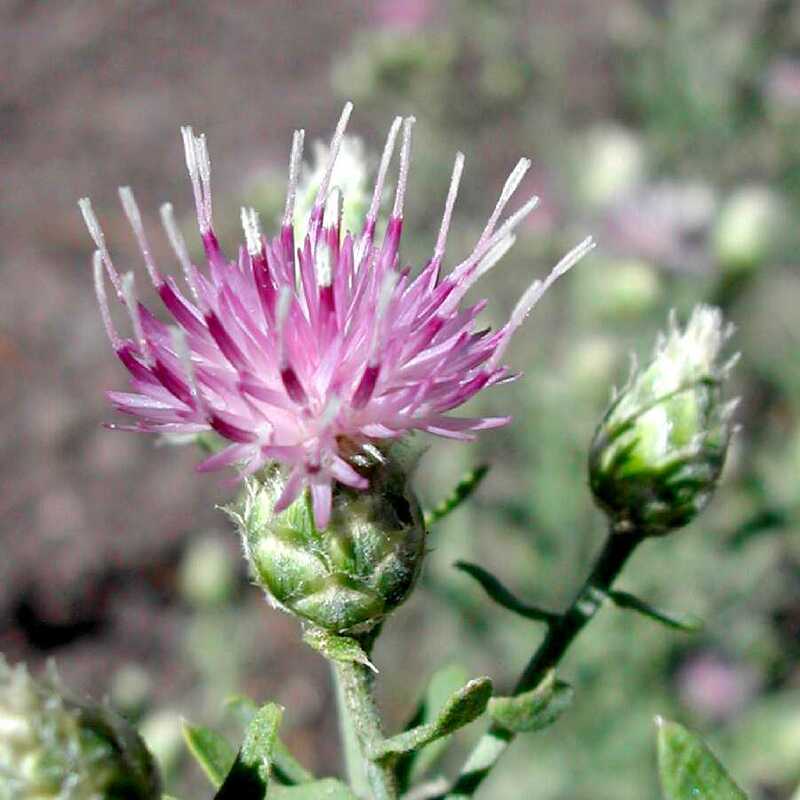 Weedy characteristics: Russian knapweed is highly competitive and aggressive and can live for decades. The buds on the horizontal roots form shoots which grow into independent plants, making it very hard to eradicate, and the active roots grow fall through winter. It releases allelopathic (toxic) chemicals that inhibit growth of nearby plants. It forms dense colonies, choking out native vegetation important to pollinators and wildlife. In large amounts, it can be toxic to horses, but not sheep or cattle. Look-alike non-native plants: Russian knapweed can be confused with diffuse and spotted knapweeds, both of which need to be eradicated, too. See separate pages on these invasive plants. Control strategies: Prevention and early detection are essential. Dig out the rosettes while young, being sure to get as much of the root as possible. Always wear gloves. Continually monitor during the growing season, and remove any additional plants before they bud, flower and go to seed. Mowing is not effective. Herbicides may be necessary for larger populations and work best on actively growing rosettes. Contact your local county extension office for more information on chemical control.